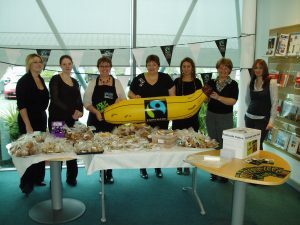 The girls at Guernsey Press showing off all the lovely cakes they have made with Fairtrade ingredients. All the cakes were sold to customers and staff, raising a super amount for Fairtrade funds. Thank you Michelle and team! Co-op has promised to source 100 per cent of its cocoa from Fairtrade farmers.